This is the best X-Universe movie so far. Don't get me wrong: Days of Future Past was excellent... I enjoyed the Wolverine movie (not X-Men Origins: Wolverine, the other one) and X2: X-Men United ranks right up there with Spiderman 2 as one of the best entries in the increasingly sprawling genre that is the superhero movie. Deadpool, however, took things to an entirely different level. 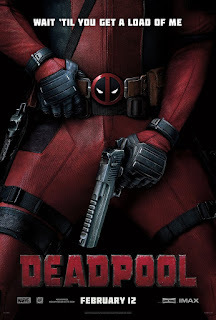 Wade Wilson (Ryan Reynolds) runs around a Canadian city that, while never named, looks a hell of a lot like Vancouver, handling contract killings and roughing up creepers for a little bit of money here and there. His days in the special forces are behind him and he seems perfectly content to just keep living life until he meets a stripper named Vanessa. (Morena Baccarin). Eventually the two fall in love and Wade proposes to her just in time to find out that he has cancer of the pretty much everywhere. When he's approached in the local assassin/hit person bar by a mysterious man that bears a passing resemblance to Agent Smith from The Matrix offering a cure, he brushes him off at first, but eventually takes him up on the offer, only to find out that the cure isn't what he was expecting. Wade is held captive and repeatedly tortured to try and trigger a mutation of some kind, which eventually happens, but leaves him horribly scarred but with the ability to regenerate and heal from pretty much every injury you can imagine. Not wanting to return to Vanessa looking like he does, Wade wants to track down Agent Smith and the man responsible for his torture, Ajax to make them 'fix his face.' The usual amount of killing, death, destruction and mayhem follow in his wake- and catch the attention of The X-Men, who send Colossus and Negasonic Teenage Warhead to try again to persuade Deadpool (as Wade now calls himself) from shooting everyone and to join the X-Men. While Deadpool turns down their pitch to join up, they do help him recover Vanessa from the clutches of Ajax (who has put two and two together and figured out who Deadpool really is and promptly kidnaps her) and while monumentally (and rightfully) pissed off at Wade for not, you know, letting her know that he's alive, she decides that she still loves him, scars and all and the movie ends happily ever after, etc, etc and leaves us all wanting the inevitable sequel to come out next month instead of in a couple of years. As much as Days of Future Past did to erase the bad taste of X-Men 3: The Last Stand from the minds and mouths of fans of the franchise, so Deadpool laid to rest, once and for all, the terrible, terrible portrayal of the character from X-Men Origins: Wolverine. This was the perfect portrayal of the wise-cracking, profane, vaguely perverted, cartoonishly violent, fourth-wall breaking character and the refreshing injection of irreverence and actual humor into a superhero movie is an intriguing wrinkle for a genre (oeuvre?) of movies that seems to have become very preoccupied about taking themselves very seriously. Irreverence and humor can work for these movie- as can R-ratings. The next Wolverine movie has already been announced as an R-rated movie and they've already said that the sequel to Deadpool is going to feature have his long-time foil and partner Cable. If I have one, tiny quibble with this movie, it's with the obvious: why didn't Wade just tell Vanessa he was alive to begin with? It'd be one thing if he had and she was all like 'ewwwww, gross'- then I could see his motivation to fix his face- and when at the end of the movie she was totally down with his scarred appearance and all that, it made a lot of the violence seem absolutely unnecessary. A lot of lives could have been saved if Wade would have just told his girlfriend he was alive but a little messed up, cosmetically speaking. But then again, I suppose cartoonish levels of violence that's not strictly necessary also fit well with the character of Deadpool. *Since they're obviously in Canada, this begs the question: do they start tugging at enough strings to get us into Weapon X? Or even Alpha Flight? I think they could have a lot of fun with the fact that Canada seems to produce an inordinate amount of superheroes/villains in the comics.